Dramatic doomsday scenario in which the Cold War fully escalates. The story is told through a live news report that follows the apocalyptic world-ending nuclear exchange between the U.S.A. and the U.S.S.R.
Four People. Three Minutes. Two Choices. One Chance For Survival. President: We got Alice in one plane and the mad hatter in another. There have been many attempts to portray some of the overall horror of supposed conflict between the Soviet Union and the United States. For many who have been in the forces, By Dawn's Early Light came very close to everything we were taught, everything we had to prepare for, if the real thing ever happened. 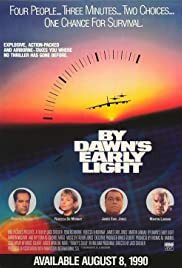 Whilst some films seek to show the madness of nuclear conflict (Strangelove) and others try to portray what might happen if things went wrong (Fail-safe), By Dawn's Early Light shows the picture from both the crew doing their job, delivering nuclear ordnance, to the President trying to turn the war off whilst his successor, badly advised, seeks to strike back with all his might to destroy the enemy and win the war. In the end, the conclusion that both the crews and the executive branches reach, is that global thermonuclear war IS madness and that the only safe solution is not to play. In the film, the conflict is started with a renegade/terrorist attack on the Soviets. All we can hope, is that when the first terrorist nuclear weapon is used (probably on the west), the executive branch realise that the only solution is to find a way to a) take the weapons out of the hands of the irresponsible and b) try not to take retaliatory action. The performances by James Earl Jones, Rebecca De Mornay and Powers Boothe are exceptional. The film would have been better without the personal relationship between the last two, but even with the limited budget for special effects, they managed to pull off a believable and tense drama. If America ever has to commit to nuclear war, I hope they have men of the character of James Earl Jones's General. A man who follows orders, but is just as prepared to question if the orders are illegal and insane and act against them.